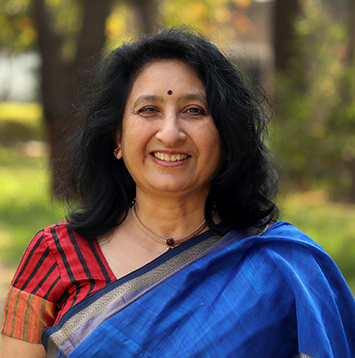 Prof. Manisha Pathak Shelat chairs the Center for Development Management and Communication (CDMC) at MICA. She is also the editor of the Journal of Creative Communications published by MICA for Sage. Prof. Pathak-Shelat has taught and worked as media consultant/trainer and researcher in India, Thailand, and the US. She has a Ph.D. in Mass Communication from the University of Wisconsin-Madison, USA and in Education from the Maharaja Sayajirao University of Baroda, India. Prof. Pathak-Shelat's special interests are new media, civic engagement, transcultural citizenship, young people’s media cultures, intersection of civic and consumer cultures, media literacy and gender. Broadly, her research over the years has addressed the question of how ordinary individuals engage with media to experience agency, to explore identities, and to participate in social change. Recent projects include an Academy of Finland sponsored multi- country youth media participation project, a study on online civic engagement and transcultural citizenship, and a study on digital youth cultures in India. Prof. Pathak-Shelat has shared her research on several international platforms and her work has been published in Journal of Youth Studies, New Media & Society, Journal of Children and Media, Communicar, Media Asia, and as chapters in several books. She has received a number of awards and fellowships including The Soviet Land Nehru Award, Shastri Indo-Canadian Faculty Research Award, The Salzburg Seminar Fellowship and TATA Fellowship for the Study of Contemporary India. Currently she serves as Vice-Chair for the Media Education Research section of International Association for Media and Communication Research (IAMCR). Comparative Research on Youth Media Participation; Digital Youth Cultures. Frau-Meigs, Divina, Kotilainen, Sirkku & Pathak-Shelat, Manisha. Eds. (forthcoming in 2019). Handbook on Media Education Research. IAMCR-Wiley handbook series. Pathak-Shelat, Manisha. (2004). Communication for gender sensitization: The value discussion approach. New Delhi: Concept Publishing Company. A set of 12 energy and environment stories for tribal children of Gujarat (in Gujarati). (1995). Member of the writing team. Vadodara: The Gujarat Energy Development Agency (GEDA). Pathak, Yogini and Pathak-Shelat, Manisha. (1989). An Experiment in Working with Rural Community: the Emerging Role of the Child Development Worker. Vadodara: Department of Child Development, The M.S.University of Baroda. Bhatia, Kiran & Pathak-Shelat, Manisha (2017). Understanding the Role of Media Education in the Age of Religious Pluralism: Rhetoric of differences and similarities. Interactions: Studies in Communication & Culture, 8(2-3), 189-209. Tayie, Samy, Pathak-Shelat, Manisha & Hirsjarvi, Irma. ( 2012). Young people's interaction with diverse media: Observations from the media diaries of Egypt, India, Finland, Argentina, and Kenya. Comunicar, 39. Pathak-Shelat, Manisha & Desai-Chopra, Niti. (2011). Journalism education for contemporary challenges: Global understanding through virtual classroom. Global Partners in Education Journal, 1 (1), 21-29. Riaz, Saqib, Pathak-Shelat, Manisha, & Sinha, Arbind. (2006). Role of sports in international relations: A cross cultural study of reflections of sentiment through newspapers. African Journal of International Affairs and Development, 11 (1), 97-127. Chakraborty, Mukta & Pathak-Shelat, Manisha. (2004). Cinema and society: Reflections of patriarchal values in selected Indian (Hindi) blockbusters. Communicator, xxxix (1), 67-85. Pathak-Shelat, Manisha. (1998). Communication for gender sensitization: Value discussion approach. Media Asia, 25 (4). Pathak-Shelat, Manisha (2018). Social media and youth: Implications for global citizenship. In (Eds. ), E. Sant & C. Peck, Handbook of global citizenship and education. Palgrave Macmillan. Sharma, Aanchal & Pathak-Shelat, Manisha (2017). The cultivation and reception effects of gendered images: Proposing ways to move beyond gender based stereotypes for boys and girls. In D. Lemish & M. Gotz (Eds. ), Beyond the stereotypes – Boys, girls, and their images. Gothenburg: The International Clearinghouse on Children, Youth and Media. Pant, Saumya, Pathak-Shelat, Manisha, Sharma Aanchal, & Krishnatreya, Pradeep (2016). Exploring individual, cultural, and structural components of health communication programmes: A gender integrative approach. In (Eds. ), R. Vemula & S. Gavaravarapu. Health Communication in the changing media landscape. Basingstoke: Palgrave Macmillan. Kotilainen, Sirkku & Pathak-Shelat, Manisha (2015). Media and Information Literacies and Well-Being of Young People: Comparative Perspectives. In S. Kotilainen and R. Kupianen (Eds. ), Reflections on media education futures. Goteborg: NORDICOM. Pathak-Shelat, Manisha. (2014). Constructing online spaces for intercultural dialogue: Media literacy initiatives for global citizenship. S.Culver & P.Kerr (Eds. ), 2014 Yearbook- Media and Information Literacy and Intercultural Dialogue: Global Citizenship in a digital age. Sweden: The International Clearinghouse on Children, Youth and Media in collaboration with UNESCO/UNITWIN. Pathak-Shelat, Manisha. (2013). Media literacy and well-being of young people. In A. Ben-Arieh, F. Casas, I. Frones and J.E. Korbin (Eds. ), Handbook of Child Well-Being:Theories, Methods and Policies in Global Perspective(pp.2057-2092).Berlin: Springer. Pathak-Shelat, Manisha. (2011). Youth and the paradoxes of Indian media situation: Consideration for a socially responsible youth media policy. NORDICOM yearbook 2011: New questions, new insights, new approaches (Pp.189-199). Goteborg, Sweden: NORDICOM. Pathak-Shelat, Manisha, Desai-Chopra, Niti & Srivastava, Madhuri (2010). Copyright or right to copy: Issues of intellectual property rights and the new media. In A. Nanavati and M. Sayed (Eds. ), Impact of intellectual property rights in post WTO era: India and Canada (pp.80-103). Centre for Canadian Studies. The M. S. University of Baroda. Pathak-Shelat, Manisha. (2008).Dosti Ki Pathshala: The role of school in gender equality. In Rameshwari Pandya (Ed. ), Women, welfare and empowerment in India – A vision for the 21st century. New Delhi: New Century Publication. Pathak-Shelat, Manisha. (2006). Market forces, media, and schools: A case of youth news network (YNN), Canada. In (Eds. ), Arti Nanavati and Umesh Naik. Market forces and cultural change: Canada–India (pp.128-142). Centre for Canadian Studies, The M.S. University of Baroda. Desai-Chopra, Niti & Pathak-Shelat, Manisha. (2005). Navigating uncharted territories: Children, youth, and the Internet. In Subhash Joshi (Ed. ), Children, youth and electronic media: Prospects and portents (pp.181-200). New Delhi: B.R.Publishing Corporation. Pathak-Shelat, Manisha. (2002).Kids did it! InMamata Pandya and Meena Raghunathan (Eds. ), Wild dreams, Green screens. Ahmedabad: Centre for Environment Education. Pathak-Shelat, Manisha. (2001). Media literacy in India. In Manoj Prabhakar and Sanjeev Bhanavat (Eds. ), Whither journalism and PR education. Jaipur: University Book House (Pvt) Ltd.
Pathak-Shelat, Manisha. (2015). Rethinking youth media cultures in the global and digital world. Journal of Children and Media, 9 (4), 536-539, Invited review http://dx.doi.org/10.1080/17482798.2015.1089078. Nande, Kaustubh & Pathak-Shelat, Manisha. (2003). An online magazine for and by children: A quasi experimental study. Working paper No. 2003-07-04. Ahmedabad: Indian Institute of Management. Pathak-Shelat, Manisha. (1995). Has the new man emerged? Changing image of man in Indian advertisements. WHODSIC Working paper. Vadodara: Women Households Development Studies Center. Video presentation of a writing and documentation training program for Adani Foundation (a corporate social responsibility organization), India, 2012. Pinning hope: Video documentation of HIV/AIDS awareness programs sponsored by UNICEF in Gujarat. Script and visualization. WHODTRAC, The M.S. University of Baroda, 2007. Milestones: Video documentation of the evolution of the women households development studies center. WHODSIC, The M.S.University of Baroda,1995. Applied Theatre as Praxis: Tackling Religion-Based Violence in Rural Schools in Gujarat through Theatrical Forms of Resistance. International Association of Media and Communication Research, The 61st Scientific Conference, Eugene, OR, USA, June 2017. Paper presentation jointly with Kiran Bhatia. She is Offline: India’s Digital Gender Gap. The 61st Scientific Conference, Eugene, OR, USA, June 2017. Panel presentation on Digital Inequalities in South Asia with Agrawal, Binod et al. Engaging the world: Digital Literacy for Transcultural Citizenship. International Association of Media and Communication Research, The 60th Scientific Conference, Cartagena, Colombia, July 2017. Paper presentation jointly with Kiran Bhatia. The Archive and Beyond: Expanding Spheres of Feminist Art and Activism. International Communication Management Conference, MICA, Ahmedabad, India. January 2017. Paper presentation jointly with Christine L. Garlough. Digital Archives and the Politics of Decay: Analyzing the Process of Preserving of South Asian Feminist Political Posters. Annual Conference on South Asia, University of Wisconsin-Madison, Madison, WI, USA. October, 2016. Panel presentation with Christine Garlough et al. Conceptualizing gender and cooperative conflict through a participatory communication lens. International Communication Management Conference, MICA, Ahmedabad, India. January 2017. Poser presentation jointly with Aanchal Sharma. Young People’s Civic and Political Engagement through Participatory Practices in a Networked Community: Global Civic Online Platforms as Spaces for Realizing Young People’s Civic Rights. International Association of Media and Communication Research, The 59th Scientific Conference, Leicester, UK. July 2016. Paper presentation jointly with Kiran Bhatia. Understanding Digital Sharing by Gen Y among Different Reference Groups for Product Purchase in India. Marketing Reborn: Traditions, Trends, and Techniques. MICA International Communication Management Conference. MICA, Ahmedabad, India. February 2016. Paper presentation jointly with Akanksha Garg, Varsha Jain, and Russell Belk. Marketing Reborn: Traditions, Trends, and Techniques. MICA International Communication Management Conference. February 2016. Chair, Global and Cross-Cultural Marketing. “Cyberactivism, Civic Agency, and Social Change: The Significance of Discursive Civic Action.” International conference on Communication for Social Change, Castellon, Spain, May 2015. Paper presentation. “Transcultural Citizenship and the Internet: Negotiation of the Global and Local Civic Identities.” MICA International Communication Management Conference, Shela, Ahmedabad, India, February 2015. Paper presentation. Beyond 2015 Copenhagen CSO conference. Copenhagen, Denmark, November 2014. Contributorin the working groups on Gender Justice and Inequality and Citizen Participation and Inequality. “Media and Civic participation in Indian Youth: From Emotional Engagement to Action.” Media Education Futures. International conference organized by the University of Tampere. Tampere, Finland, May 2014. Keynote address. "Studying Facebook: The Ethics of Drawing a Sample in the Networked Age.”Association for Education in Journalism and Mass Communication, Washington, D.C., 2013.Paper presentation jointly with Sue Robinson and Dave Wilcox. "Cyberactivism: Slacktivism or Digital Citizenship?" Association for Education in Journalism and Mass Communication, Washington, D.C., August 2013. Organizing member of the panel. "Challenging Eurocentrism in International Comparative Research: Reflections on an International Youth Media Participation Study." International Communication Association Conference, London, May 2013. Paper presentation jointly with Sirkku Kotilainen and Irma Hirsjarvi. "Activist Community/Social Media and Global Youth Movements: Studies from the Global South." International Communication Association Conference, London, May 2013. Member of the panel. “Becoming Global Citizens through Digital Media: Pathways to Transnational and Digital Public Engagement for Young Women.” Digital Media and Learning Conference, Chicago, IL., February 2013. Paper presentation. "Digital Youth Cultures in Small Town and Rural Gujarat." Association for Education in Journalism and Mass Communication, Chicago, August 2012. Paper presentation jointly with Cathy Deshano. Among the top papers in Markham Student Paper Competition. "Global Transformers or Captive Consumers: Addressing Complexities in Youth Media Participation." Mediaeducation.now: National seminar organized by the Finnish Society for Media Education and the Finnish Society for Youth Research, Helsinki, Finland, November 2011. Keynote Address. "(En)Acting Gender Equity: Boal’s Theatre of the Oppressed for Gender Sensitization." Women’s Worlds 2011: Ottawa, Canada, June 2011. Workshop presentation with Beth Godbee, Rasha Diab and Tanya Cochran. "New Media in the Lifeworlds of Young People in India." The 39th Annual Conference on South Asia. Center for South Asia, Madison, October 2010. Paper presentation and panel chair. "Negotiation of Ethnic and Gender Identities: Second Generation Indo-American Girls and Consumption of Bollywood." Midwest Popular Culture Association & Midwest American Culture Association Annual Conference, Minneapolis, 2010. Paper presentation. "Youth and the Paradoxes of Indian Media Situation: Considerations for a Socially Responsible Youth Media Policy." World Summit on Media for Children and Youth, Karlstad, Sweden, 2010. Invited Panelist. "Global English in the Wisconsin Classroom: Strategies for Supporting Multilingual Writers in Your Course." Teaching & Learning Symposium, UW-Madison, 2010.Workshop presentation with Beth Godbee. "Acting Out: Anti-racism and Boal’s Theatre of the Oppressed. State Convention, Wisconsin Council of Teachers of English, Milwaukee. 2009. Workshop presentation with Beth Godbee, Salvatore De Sando, and Priscilla Lizasuaina. "Learning to use the Head and the Heart together: Development of Critical Thinking and Sensitivity through The Value Discussion Approach in the Classroom." Teaching-Learning symposium, UW-Madison, 2009. Workshop presentation. "Journalism Education for Contemporary Challenges: Global Understanding through Virtual Classroom. International workshop on Journalism and Journalism Education in the US. Indiana University School of Journalism, Bloomington, IN, USA, May-June 2008. Presentation (invitee of the U.S. Department of State). "Copyright or Right to Copy: Issues of Intellectual Property Rights and the New Media. International seminar on Impact of Intellectual Property Rights in Post WTO Era: India and Canada." Centre for Canadian Studies and Faculty of Law, The M. S. University of Baroda, Vadodara, 2007. Paper presentation. "Split-Screen: Work of Indo-Canadian Film Makers. International Symposium on One hundred Years Of Indian Immigration to Canada. James Reany Canadian Studies Centre, Gujarat University, Ahmedabad. 2006. Invited speaker. "The Things We Carry: Environment and Consumption-Expression of Young Voices through Video." International conference on Women’s Impact on Science and Technology in the New Millennium. Third world Organisation for Women in Science (TWOWS). Bangalore, November 2005. Poster presentation. "Getting their Voices Heard: Asian Youth and Global Communication." Summit 2000: Children,Youth, and the Media beyond the Millennium. Toronto, Canada, 2000. Paper presentation. "Has the New Man Emerged? Changing Image of Man in Indian Advertisements." International Association for Mass Communication Research (IAMCR). The 19th Scientific Conference, Seoul, Korea, 1994. Paper presentation. Periodical Articles: More than 100 articles in English and Gujarati periodicals including Femina (English and Gujarati), SPAN, Navneet-Samarpan, and Wavelength. Resource person. Peer Pressure Is Not Always Bad: Making Peer Reviews a Rewarding Experience in Writing-Intensive Courses, University of Wisconsin-Madison, 2009. Resource person in the areas of communication, NGO-media interface and grant writing, Capacity Building program for NGOs. The United Way of Baroda, Vadodara, 2001-08. Resource person, Use of Internet in Research and Education, National workshop for university teachers. The James Reany Canadian Studies Centre, Gujarat University, Ahmedabad, 2007. Resource person in the area of communication, Health Communication training program for Block IEC Officers of Department of Health & Family Welfare, Govt. of Gujarat. Mudra Institute of Communications Ahmedabad (MICA), 2006. Guest faculty, International Lecture Exchange program (Online). East Carolina University, Greenville, NC, USA, 2006. Guest lecturer, Media Education at School Level, Department of Education, Faculty of Education and Psychology, The M S University of Baroda, Vadodara, 2005-06. Guest lecturer, Gender Sensitization and Schools, Department of Education, Faculty of Education and Psychology, The M S University of Baroda, Vadodara, 2005-06. Guest faculty, Women and Media, Interdisciplinary intensive course in Women Studies. Women Studies Research Centre, The M.S. University of Baroda, Vadodara, 2005. Resource person and local coordinator, Workshop on Interfacing with the Media: Projecting the Right Image, organized jointly by the Faculty of Journalism and Communication, The M S University of Baroda and the United Way of Baroda. The workshop was supported by a grant from the United States Department of state with staff assistance from the collage of Mass Communication and Media Arts, Southern Illinois University Carbondale USA, 2002. Resource person on Effective Communication, in-service training for forest officers. Center for Environment Education (CEE), Ahmedabad, 2000. Resource person on Gender and Media, Gender Sensitization workshop organized by the Commissioner, Department of Women and Child Development, Government of Gujarat, 1996. Resource person, Audio-visual approaches in Energy Education, Training workshop for grass-root level rural women volunteers. Gujarat Energy Development Agency (GEDA), 1994. Capacity Building program for NGOs. The United Way of Baroda, Vadodara. 2001-2008 (United Way of Baroda has more than a hundred member NGOs working in a diverse range of sectors under its umbrella). Preparation of ‘Sexuality Education Modules for adolescents, teachers and parents’. Resource person on the research project jointly being carried out by Education Development Centre, USA; The S.P. University and The M.S. University of Baroda, India. 2002- 2003. Program leader and faculty, Capacity Development Program on Communication and Information Management for the Directorate of Information and Public Relations, Government of Arunachal Pradesh (forthcoming in July 2018). Program leader and faculty, Developing Communication Competencies for Effective Management for Institutional Strengthening of Gram Panchayat Programme (ISGPP-II), Govt. of West Bengal In association with Suman Industries Pvt. Ltd. 2018. Program leader and faculty, Effective Leadership & Team Communication, Gender, Identity and Empowerment, Effective communication with different stakeholders. Self-employed Women’s Association (SEWA), Ahmedabad. 2017. Faculty, Field Research and Effective Story-Telling. Ministry of Information and Broadcasting. Government of Gujarat. 2017. Consultant/Trainer, Effective Communication. IQR Analytics, Ahmedabad. 2016. Faculty, Communication Theories, Management Development Program for Viacom, MICA, Ahmedabad, 2015.